Central question: If the last Jew on Earth spends all his time masturbating, how do we make more Jews? 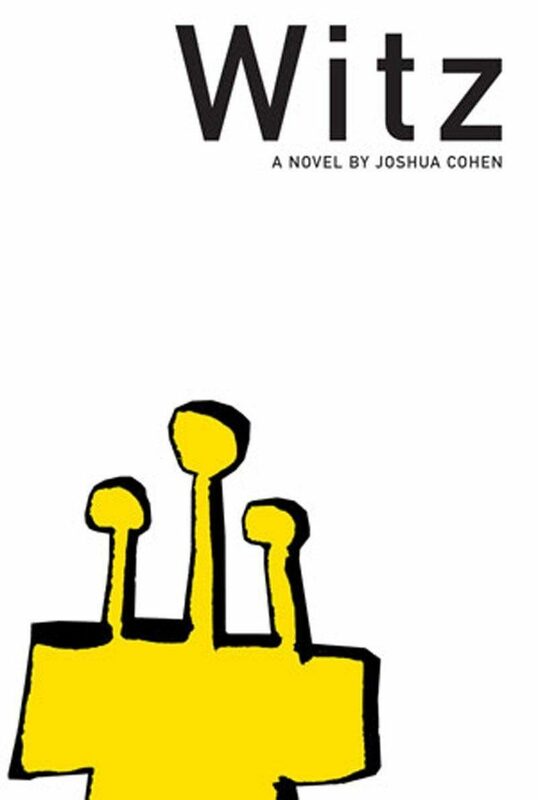 Witz is, according to its subtitle, “The Story of the Last Jew on Earth.” Appropriately, the novel’s arc follows the lifetime of Benjamin Israelien, who survives first a plague that kills all Jews except firstborn sons, then survives the systematic extinction of the survivors, who have been collected in barracks by the government. And what do the remaining masses do with our singular, symbolic Jew? We celebritize him. We pimp his religion and his haircut. His foreskin is coveted, not to keep the memory of a people alive, but rather for cloning, to propagate the vogue new kosher style. Then, when he does not play ball, we demonize and denounce him, make him a fugitive, a farce. Before all this calamity and covetousness, we lurch through Benjamin’s family history via his father, Israel, his mother, Hanna (the Jewish Joseph and Mary), and his twelve sisters, whose number echoes the cancers that riddle his father’s flesh: “His tumors everywhere have tumors themselves, and those tumors, tumors… tumors unto tumors unto the umpteenth generation, why not.” Even as our last Jew retreats through what seems a destroyed, dying America (“torching ponds of stray gas to flame, guttering at trunks of all sunken with nothing left ringing above them to burn, no soul left to become ash, air, damning sky…”), he carries forward the remnants of a murdered people—his parents, sisters, and all the dead Jews who have come before—lost unto themselves. And yet nothing is holy. Money pollutes everything and everyone. The text both consecrates and desecrates through unflagging images of death and rebirth: trees choke themselves, an ocean freezes, flat expanses of earth turn to slopes, inviting the fall. Even Ben can’t seem to take himself seriously; we are given a logbook of his methods of masturbation and a recipe for baking a new mother, in which some of the instructions read, “Do not watch water. Do not hope”: two more morbid punch lines in a black litany of jokes on creation. Sometimes the narration seems to thumb its nose even at itself, as if on looking death straight in the face all that’s left to do is to grin and nudge its ribs. The true spectacle and horror of Witz, without question, is the music of its prose, simultaneously hypnotic and symphonic, reverent and profane. Cohen will certainly be compared to Joyce for his predilection for portmanteau, long strings of rhythmic shifts and bends, relentless variations on a tone. The novel is also reminiscent of Pynchon or, even more, maximalist Beckett for its odd manipulation of time, sliding from grotesque close-ups to decade-long sweeps and somehow seeming to encompass the span of all of time. Cohen packs whole histories and destructions, maps and traditions, into single sentences. He employs lists, codes, and invented syntax with the sure hand of a visionary, his prowess and passion further emboldened by a boundless sense of scope. Witz reflects both the depth of one person’s pathos and the breadth of a whole people, somehow both intensely personal and open wide, “more like a book whose pages are inseparable from one another, its covers, more like a time that doesn’t proceed forward or back but that stands still subsuming every moment, past, present, and future.” This is not your mother’s sentimental Jewish novel, offering clarity to hope; this is your great-great-grandmother’s tumor’s tumor’s horror, a joyous death-shriek aimed straight down all your fleshly holes. Blake Butler is the author of five book-length works of fiction, including 300,000,000 (Harper Perennial), Sky Saw (Tyrant Books), There is No Year (Harper Perennial), Scorch Atlas(Featherproof Books), and Ever (Calamari Press), as well as the nonfictional Nothing: A Portrait of Insomnia (Harper Perennial). His fourth novel, Alice Knott<.em>, will be published by Riverhead in 2019. His short fiction, interviews, reviews, and essays have appeared widely, including in The Believer, The New York Times, Bomb, Bookforum, and as an ongoing column at Vice. He is a founding editor of HTMLGIANT and currently serves as editor of the Fanzine. He lives in Atlanta.